This is a classic Taiwanese recipe that is perfect for a quick and speedy supper. 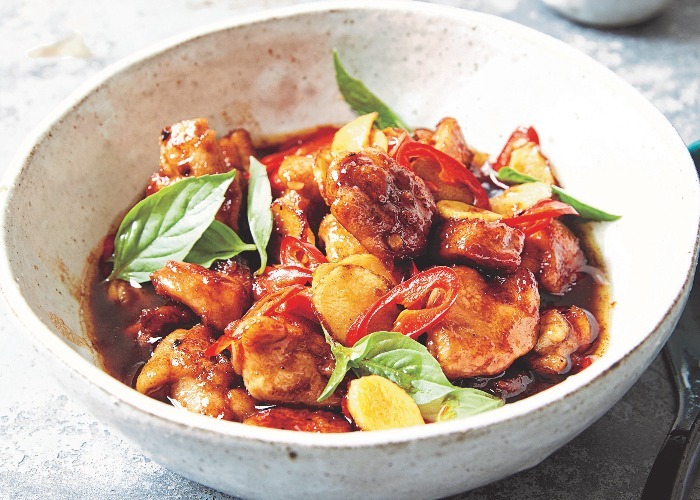 It’s called three-cup chicken because traditionally it uses 1 cup of soy sauce, 1 cup of rice wine and 1 cup of toasted sesame oil – in this recipe there’s not quite 1 cup of each but certainly equal measures of all three. If Japan is famous for inventing teriyaki sauce, Taiwan is famous for its three-cup chicken sauce. The sweet basil at the end imparts an aniseed aroma and taste, which pairs perfectly with this dish. If you can’t get Taiwanese basil, try Thai sweet basil or sweet basil. Place the chicken in a bowl, add the salt and ground white pepper and then dust with the cornflour. Mix well to coat then set aside. Heat a wok over a high heat until smoking and add the rapeseed oil. Add the ginger slices and fry until crispy and golden, then add the garlic and red chilli and toss for a few seconds to release their flavour. Add the chicken pieces and leave for 10 seconds to sear and colour, then flip them over. Season with Shaohsing rice wine or dry sherry and stir-fry for 2–3 minutes on a high heat until the chicken is almost cooked. Add the light soy sauce, the toasted sesame oil and sugar and cook for 5 minutes until the liquid has almost evaporated. The chicken should have a dark brown, slightly sticky shine. Add the basil leaves and toss through to wilt, then take off the heat and serve immediately.